Day three of the Amazing Digit-al dozen week long Halloween themed posts. 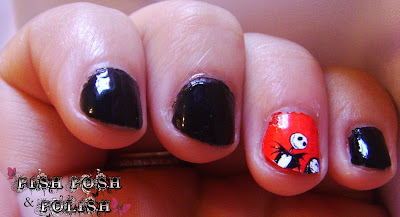 I'm sorry for the Blink 182 song reference in the title but today I have a manicure featuring maybe my favourite film of all time The Nightmare Before Christmas, back before Burton got caught up in making sure Johnny Depp was in all his films and before he got obsessed with style over substance came this masterpiece. 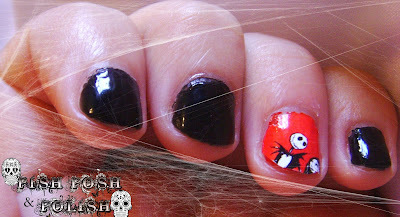 How could It be Halloween without me showing you all this manicure? This manicure is two coats of Barry M Black and then a coat of Barry M Bright Red on my accent nail. Luckily the red was an exact match for these cute full-sized nail stickers I have from Claire's (which I bought last year in the sale). The nail sticker has a sticky back so all I had to do was position it and press it down firmly. I cut and filed the sticker to fit my nail. Anyway isn't this cute? And like most of my posts really simple. I love rocking the accent nail. What do you think? I would love to hear from you!! This is so adorable! I just love Jack and Sally. We named our first cat Sally, after that character, in fact. <3 Awesome mani, Kerrie! Love! One of my favorite movies! Very Cute I love Jack! You've gotta love a good 'Nightmare' mani!